1. CLO – Chief Lounge Officer. We looking for someone with the hospitality of Adrian at the George V in Paris, but with experience from modern retail and property development. A tricky one. 2. CAO – Chief Apparel Officer. 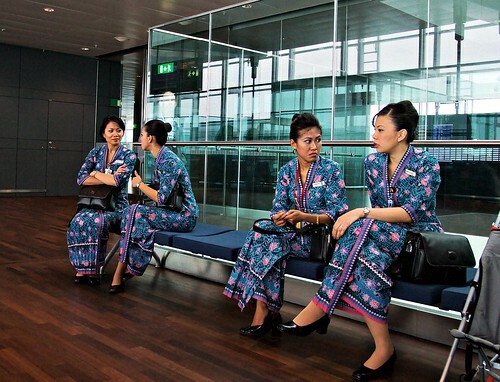 What could be more important in an airline cabin that what the crew are wearing? We can’t think of anything. So we would be looking at someone from Asiana, obviously. 3. CMC – Chief Maître de Cabine. No point improving perfection, so the legacy from Swiss should live on. The regular six languages and concierge knowledge of the normal top 50 cities will do. 4. CISO – Chief Inflight Service Officer. This one is easiest, by far. We’ll just get Terence, the butler from the Grand Hyatt in Hong Kong, straight away. 5. CTO – Chief Timetable Officer. If you take your airline seriously, you take your timetables seriously. And as often as we’ve had to experience downloaded and badly designed PDF:s, instead of gripping on to a sturdy and finely printed dito – we feel that this is an issue that needs its own manager. Probably a German. With a management like that, it would take more than a global economic depression to keep Brûlé Airways on the tarmac. On the crew front, my jury’s out on who I’d have in the cockpit but I’d definitely have Italians to man the on-board espresso machines and I’d hire my friend Kamal Mouzawak to be my chief catering officer and have him demonstrate why Lebanon’s mezze culture was made for in-flight meal service. Along with produce sourced in the Bekaa Valley and the Chouf Mountains, he’d also select the best reds from Spain, rosés from Provence, whites from Italy and beer from Turkey. After food, uniforms would be the second most exciting element and I’d leave the sourcing to my Galician friend Sagra who’d have a sleepy little espadrille firm do a smart shoe for both men and women, find an emerging French designer to produce dresses and knitwear ensembles for the girls and a solid tailor from Genoa to do the designs and manufacturing for the stewards’ and pilots’ uniforms. Would it make more sense to crew the airline from the lower-wage Maghreb countries or leave it to the Spanish or the Lebanese to run? Those Maghreb countries have that ever-charming sub-Med disposition, so our money is definitely on them. As mentioned, Mr Brûlé has expressed interest in his own airline. And after going through what the terminal would be like, our next stop is of course the aircraft fleet. Aviation purchases are always troublesome, as you are well aware of. A long line of factors need to be taken into account – range, fuel efficiency, seating arrangements and so forth. In cases like this we tend to always to lean towards people rather than specs. And who would you rather lean on than the “best thinker in the sky” – Robert Lafontan. As Airbus’s senior chief engineer he is the master mind behind the A380 (that we sincerely hope never will be produced in it’s 853 people economy class only configuration). For Brûlé Airways however, we are opting for his next project in line – the A350 XWB. So we’ll go for a few of those for long haul while settling for the more lean A320 for short and medium haul trips. That should cover the basic LHR-NRT, CPH-ZRH and ARN-PMI routes. But, as our efficient German friends Lufthansa have shown us, no airline is complete without a private jet section. So to finish off, we’ll pop in a Cessna Citation XLS+ for good measure. A pure bespoke offering for those customers that prefer a smoother debarkation. At a conference panel in Münich earlier this year the panelists including Meister Brûlé recieved the question ”If you would start a new venture, what would it be?” We will spare you the ideas from the other Hobo-Joes on the panel. TB’s answer? Starting a new European airline company. We immediately felt compelled to pick up our Blackberries and call Lufthansa’s customer service asking how we could transfer our Miles & More points to this new aviation paradise. What would it look like? Would it serve the same excellent vegetable consommé as the Marc Newson designed Qantas business class? Could it really outshine ANA’s inflight nightwear? Out of gitty excitement and since we can hardly wait for this venture to get of the ground we decided to start a series which explores potential ideas on what Brûlé Airways would be like. The first instalment in this series will be out soon.